Men’s Basketball’s post-Thanksgiving overtime win against Hofstra University Saturday may have compounded on the damage to fans’ hearts caused by copious amounts of greasy turkey served days earlier. 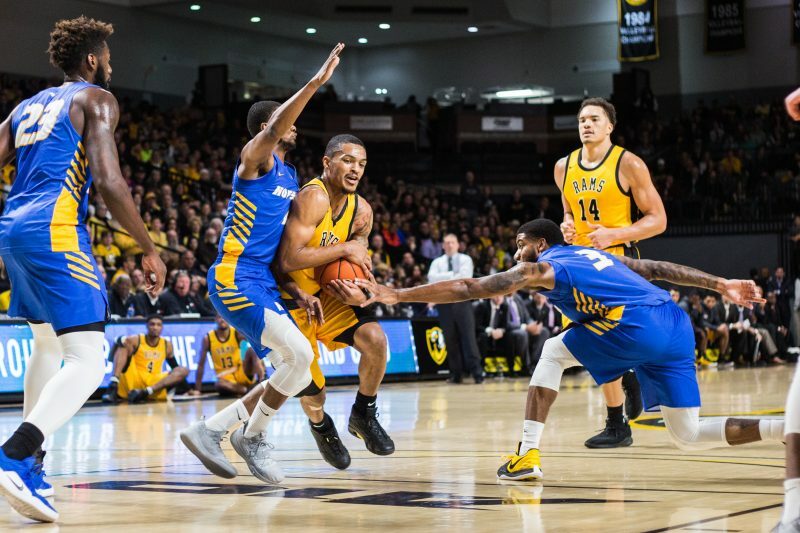 The Rams looked to be running away with the game at the Siegel Center after commanding a comfortable lead at halftime, but Hofstra came out of the gates rocking in the second half. A run after the break helped the Pride take the game to the scruff of the Rams’ necks throughout the second period. The home team ultimately prevailed 69-67 to take their record to 5-1, but only after a tense second half and clutch plays from the likes of redshirt juniors Marcus Evans and Issac Vann in overtime. IF MARCUS EVANS IS NOT YOUR HERO WE QUESTION YOUR LIFE CHOICES!! The Rams struggled early in the first half. Then, an Evans layup, followed by a 3-pointer and an alley-oop from redshirt-senior forward Michael Gilmore gave the Rams a 22-13 lead. Sophomore guard De’Riante Jenkins then netted four 3-pointers in a row to end the half, including a buzzer-beating long three off the bank to take the Rams to a 36-23 halftime lead. Jenkins led the team in scoring with 19 points, 15 of them from beyond the arc in the first half. Hofstra looked a different team in the second half. A comeback by the Pride was largely engineered off the strength of a game-high 27 points from guard Justin Wright-Foreman. The senior came into the game as the fourth-highest scorer in the country, averaging 28 points per game before heading to Richmond. Like his team, Wright-Foreman was largely subdued on offense in the first half — 23 of his points came after the break. Junior guard Eli Pemberton also racked up 17 points for the Pride, while Hofstra’s senior forward Jacquil Taylor led both teams in rebounding with 17. A 10-0 run during the second period saw the Pride take their first lead since early in the game with just under 10’ to play. Hofstra extended their lead to as much as 6 points before a 9-0 run by VCU kept it close as the clock wound down. A Wright-Foreman play saw Hofstra take the lead with 1:33 to play, but Vann tied the game up with a layup. Wright-Foreman then missed a fadeaway jump shot to take the lead with the last possession of regulation time. Evans cemented his reputation as a go-to crunch-time player for the Rams in overtime. The Rice transfer’s game-winning drive made scoring overtop two defenders look easy, as he gave the Rams the lead with about 29 seconds left for Hofstra to answer. But Vann had different ideas, the forward stole back possession for VCU and earned a foul to see out the resilient Pride. 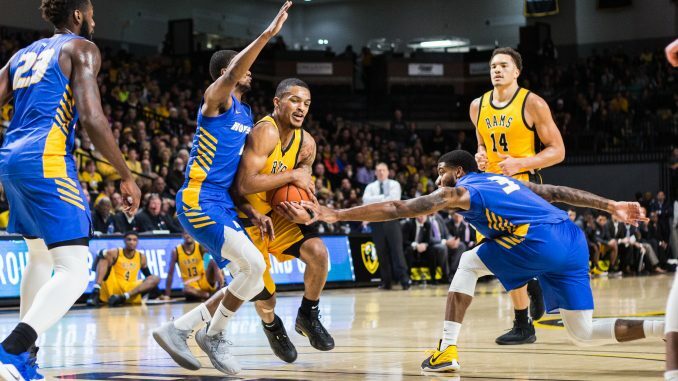 VCU’s aggressive, high-charged defense turned the ball over from Hofstra 19 times, and it may have continued to foster the growing feeling of a return of the Rams’ notorious ‘Havoc’ defense under second-year coach Mike Rhoades. Like in previous games this season, the Rams consistently spread the ball on offense, earning 15 assists. Evans led the team with 5. Ball movement, which at times appeared a strength for VCU, also occasionally proved a thorn on the team’s side. In some stretches throughout the game, the Rams struggled to take care of the basketball. They turned possession over 13 times, but the timing of those turnovers tended to hurt the team, as several came during the Pride’s second-half resurgence. Rhoades said although he would have liked to see a better performance from his team, the Rams proved they can close out high-pressure matches — a trait they didn’t have last year. 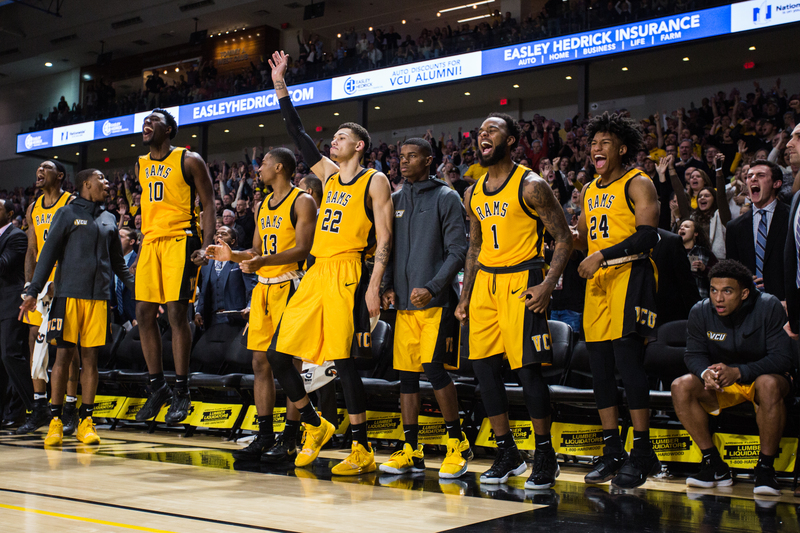 VCU is away at in-state rivals Old Dominion University Wednesday. In addition to a game against Iona College next week, the Rams will play high-profile matches at the University of Virginia next Sunday, after facing off against former Rams head coach Shaka Smart at the University of Texas Wednesday.